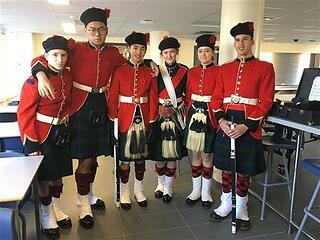 Upon completion of the Windsor ceremony, the Corps marched back to our campus keeping the cadence to the Brass and Reed Band under the guidance of Drum Major Andrew Canete. The ceremony at the School Cenotaph was memorable with the Brass and Reed accompanying Sergeant Ella Brown in a moving rendition of the Last Post. The youngest cadet Elena Julienmarched sharply to the front and, with a smart salute and impeccable drill, laid the wreath for the Corps. No trace of nervousness, just sharp drill. As the Headmaster read from the Roll of Honour and Reverend Curry gave the benediction, there was time to pause and reflect about Remembrance Day and the dignity and respect accorded this most solemn of days by the Cadets of the 254. We will remember them.